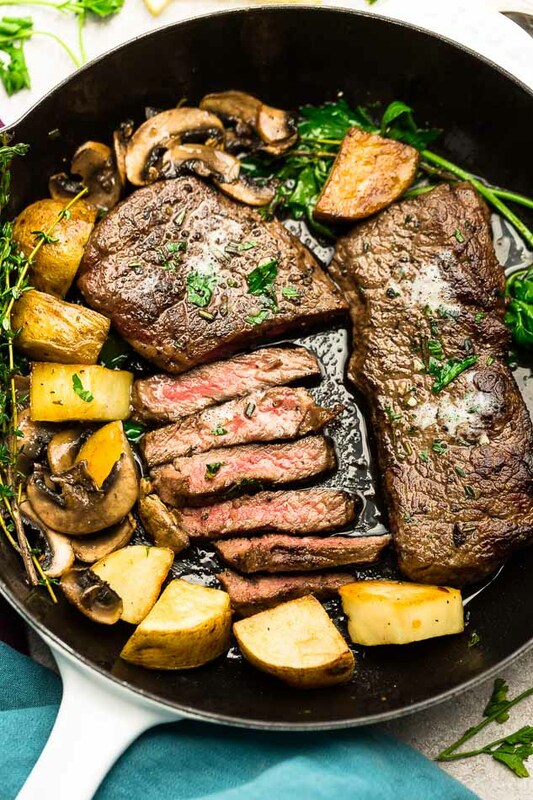 An easy one pan skillet steak & potatoes meal perfect for busy weeknights or a special date-night in. 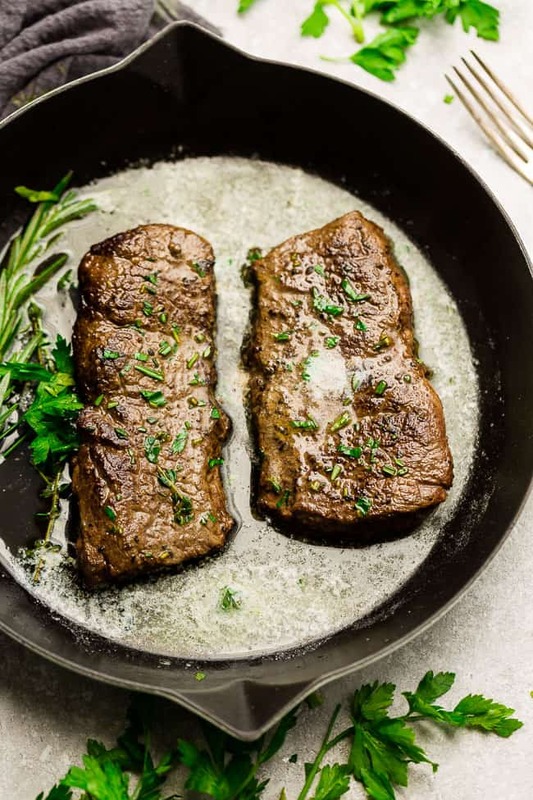 Perfectly seared steak cooks up tender, juicy in a buttery, garlic and herb sauce. Gluten free, sugar free, paleo and Whole30 compliant. If you asked my husband what his idea of the perfect dinner would be, he would hands-down say “steak and potatoes”. Before we had kids, we would go out to his favorite steakhouse for a nice steak dinner every year for his birthday. And of course since he is such a steak and potatoes guy, he would order a nice juicy steak with garlic butter potatoes. But did you know that learning how to make the perfect pan-seared steak is actually really easy. With just a few tips and tricks, you can cook the perfect tender, juicy and flavorful steak with a beautifully charred crust for that meat and potatoes guy / gal in your life. 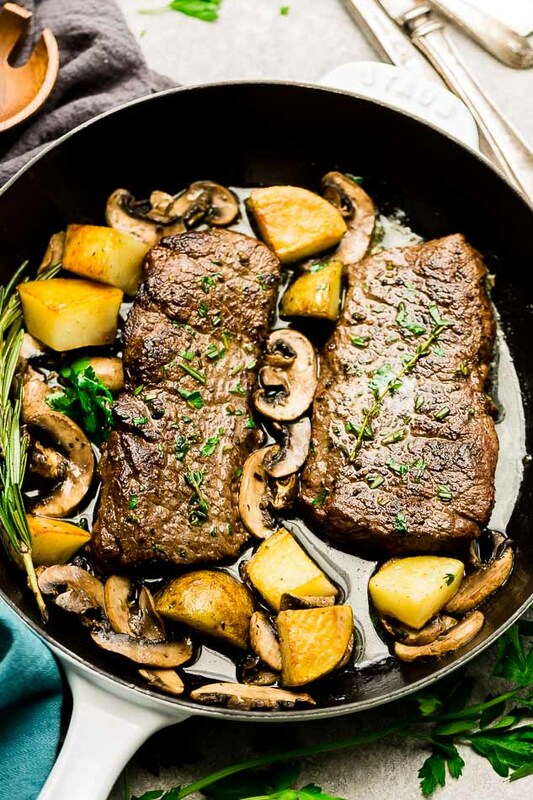 How amazing would it be if you could sit-down in the comfort of your own home to enjoy a delicious steak and potatoes dinner for a special date-night in? 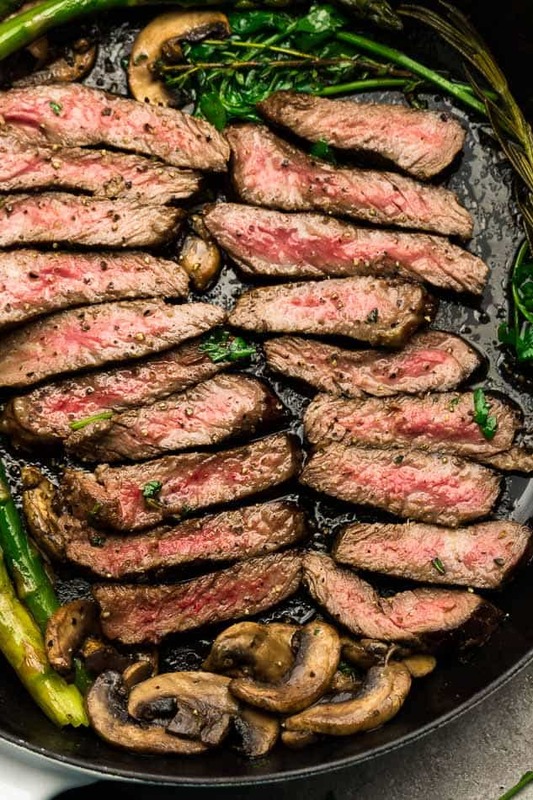 Making your perfectly seared steak at home also means you can skip the crazy crowds for Valentine’s Day, Father’s Day and during the holidays. For a perfect pan-seared steak, it’s important to go for well-marbled cuts —that extra fat enhances flavor and promotes tenderness. You can pick these cuts up at your local butcher or grocery store and be sure to ask for cuts that are one-and-a-half to two inches (1 1/2 – 2 inches) thick to ensure that your steak will reach the perfect char and maximum juiciness. Yes, absolutely. Steak is so versatile and also fits if you are following a Whole30, Paleo, low carb or a ketogenic diet. 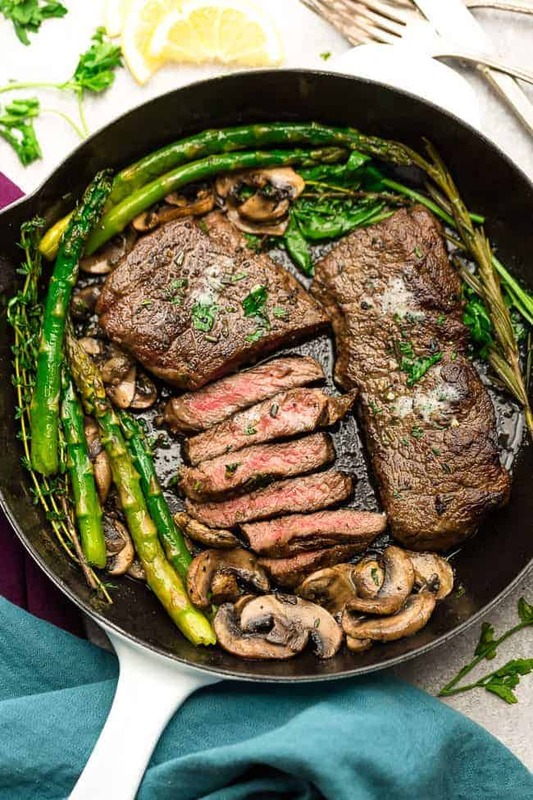 Instead of serving your steak with potatoes for keto, just swap them out for asparagus, mushrooms, turnips or jicama instead. 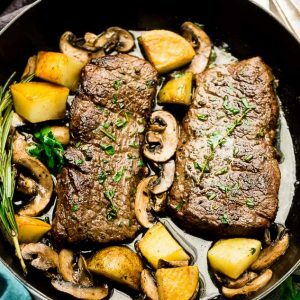 Steak and Potatoes - an easy one pan skillet meal perfect for busy weeknights or a special date-night in. 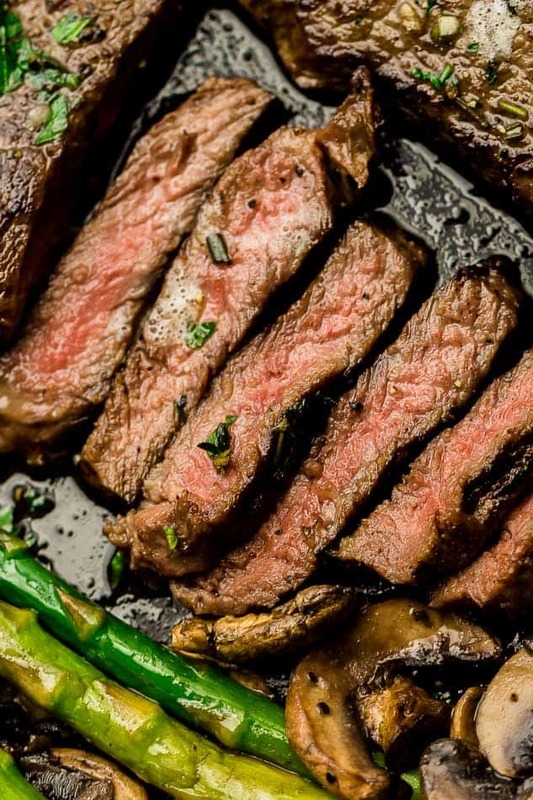 Perfectly seared steak cooks up tender, juicy in a buttery, garlic and herb sauce. Gluten free, sugar free, paleo and Whole30 compliant. Swap with turnips or jicama for a low carb / keto version. Heat a cast iron skillet over medium high heat, add 1 tablespoon avocado oil and ghee. Add the potatoes, cut-side down and season with salt and pepper. Cook undisturbed for about 5 minutes, until golden-brown. Use tongs to flip potatoes and cook for an additional 5 minutes, or until browned and the potatoes are tender. Transfer to a plate and set aside. Wipe down the skillet with paper towels and return the skillet over high heat for several minutes, until the pan begins to smoke. Add another 1 tablespoon of avocado oil to the pan and brush on the remaining oil on the steak. Generously season the steak with salt and pepper. Once the steaks are almost done, reduce heat to low. Add remaining ghee, garlic, and herbs to the pan. Use an oven mitt or dish towel, grasp the than pan handle and tilt and swirl the pan to allow butter to melt. 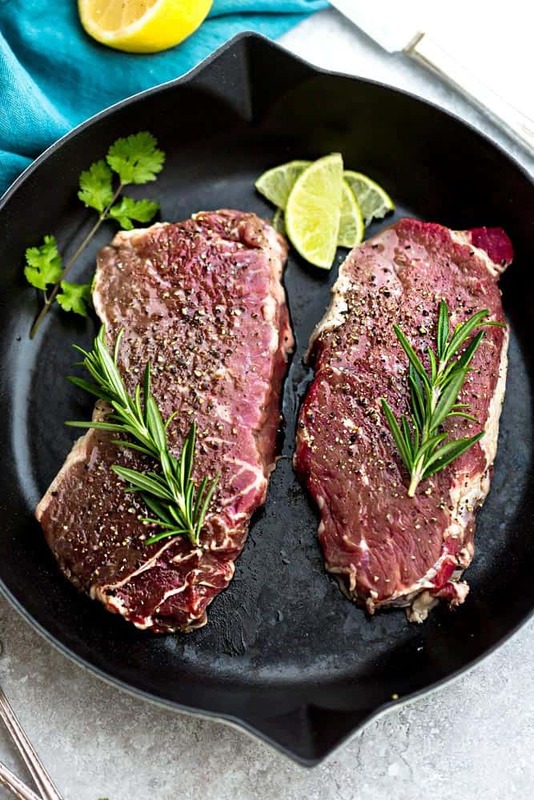 Use a spoon to drizzle and baste steaks until juicy on both sides (flip after 30 seconds) for about a minute. Serve with potatoes along with any remaining sauce.